While I was showing Gigi as a kitten, my best friend and showing buddy, Mary, was showing a black longhaired cat that someone had dumped near her house. She was a couple of months younger than Gigi, and her kitten career was more successful. She did well enough to earn a regional award! So, we packed up Rosie and Stanley (her other cat) and Gigi and Bo, and off we went to the last awards show for the TICA Northeast Region as we knew it. The regions were redrawn at the beginning of the 1994-1995 season and we were now part of the new Mid Atlantic Region. When I began claiming titles for Bo, I made up an Excel spreadsheet to keep track of his points. I added to it (and learned a lot about TICA scoring rules) when Rosie started to do well enough for us to wonder if shed make a Regional. I remember glancing at it the night before this show and making a mental note that Gigi had around 5400 points. I probably thought to myself, Wouldnt it be a kick if she Supremed, and then put that right out of my head. I was lucky that she got all the way to Quad Grand! All of the judges at the show had seen Gigi before, and some had finaled her, but this was a big show and our cats would have to compete against up and coming campaigners and the previous seasons regional winners. Andrée and Pauline even came down for the occasion, with a pretty blue kitten, Perce Neige. I was happy to see them again and even happier that they were getting the chance to see Gigi show, a whole year after I had brought her home. Poor Bo was having a rough weekend, with a ruddy regional winner in his class. He was finishing 2nd out of the two Abys in most rings and didnt make any finals. Gigi, however, was doing well! She had made two finals on Saturday, one from a judge who surprised me. 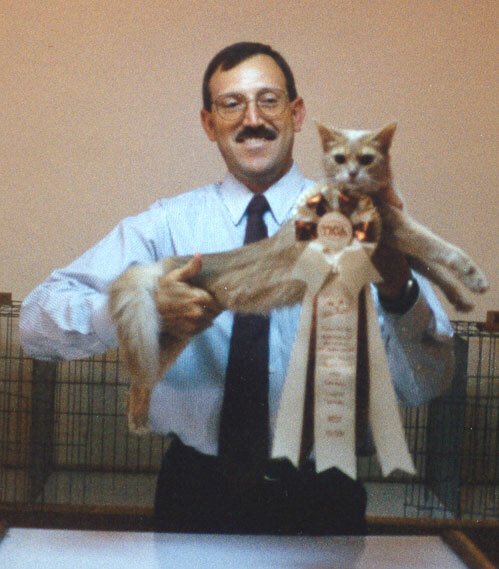 Her point total was inching ever closer to 6,000 but what judge in his or her right mind would final a fawn Somali BEST!? In the relatively short time I had been showing her, I had already figured out that a lot of judges dont understand fawn. Gigis Saturday ended in Fate Mays specialty ring. Fate gave her a nice final in June but Gigi was a little hissy in his ring. At the time I thought it was because she had been recently spayed, but now I think it was her emerging Pink Princess persona. But Gigi seemed to be having a good time at this show and since this was a specialty ring, I hoped for a final, any final. Fates clerk called the longhaired alters up in numerical order, which is usually how its done unless theres a scheduling problem. The cats are judged by breed, in alphabetical order. Gigi was last to be called to the ring. I put her in the judging cage and sat down in the front row, as usual. 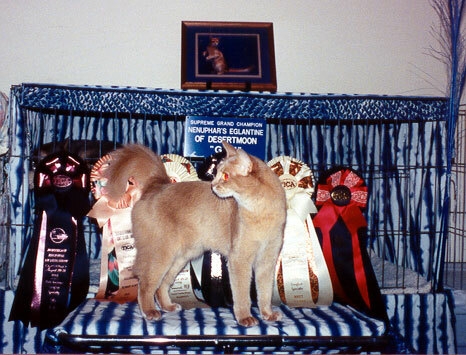 Gigi was the only Somali, so she was guaranteed Best in color and division, unless Fate saw something he didnt like! Of course that didnt happen; her presentation was good and she handled beautifully for him. After the judging was finished, it was time for the final. Fate had to pick the five cats that in his opinion, best met their breed standards. He left Gigi in her cage while he deliberated, rather than have his clerk send her back to the benching area. This was a good sign. It meant that he was considering her. 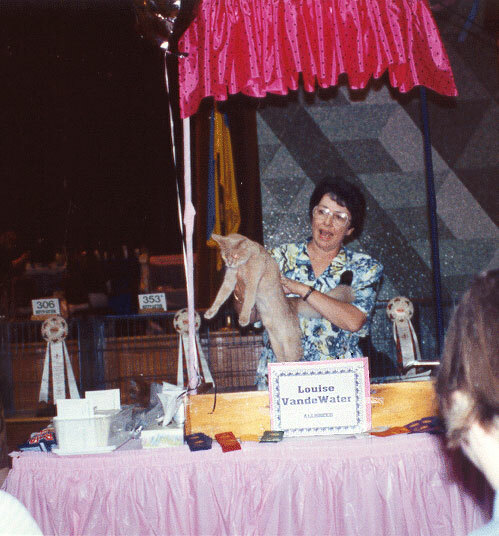 Mary came into the ring and sat down next to me, and we waited as the clerk posted the rest of the numbers and the other exhibitors brought their cats up. Since it was the end of the day and Fate only had one more class to judge after this final, he decided to have a little fun with us. He presented his 5th, 4th and 3rd best alters, and Gigi wast one of them! She and a black Persian named Bonnie were going to be his top two! The smart money was on Bonnie. Persians always win, and Gigi had never placed higher than 3rd before. Fate took both cats out and presented them again, and showed us what he liked about each cat. He held Bonnie in the air like a stuffed animal and talked about her short, cobby body, legs and tail, and her flowing black coat (this was August, shed grow more of that stuff as the season went on), and then he brought Gigi out, and stretched her so we could see her long body, legs and tail, and her nice ears and head, and her ticking. Gigi was relaxed and confident. She was good at stretching, especially in Fates hands. Andrée told me later, You cant teach that. A cat will either stretch or she wont. Foxy and Quinn dont. Next Fate picked up the two rosettes and hung one on Gigis cage first. I assumed that meant she was second. I could deal with finishing second to Bonnie. She was a pretty cat as Persians went, and her owners were nice people. He hung the last rosette on Bonnies cage, opened Gigis and took her out again? What? I didnt yell it loudly, just said it, just like that. Mary ran across the show hall to get Andrée and Pauline, who were in a ring at the opposite end of the room. I dont remember thanking Fate for the rosette or even who took this picture! I dont remember the ride to the hotel, or much about the awards banquet that night, other than receiving a bottle of champagne from Sheila, Bos breeder! Gigis good luck continued on Sunday. She made three more finals, including another BEST, allbreed this time! It was her best weekend ever. She left with six beautiful rosettes and a brand new cage sign, a gift from Andrée and Pauline. Gigi was the first Nenuphar cat to Supreme. I found out later she was the first dilute Somali SGC in all of TICA!